The vertebral arteries are major arteries of the neck. Typically, the vertebral arteries originate from the subclavian arteries. Each vessel courses superiorly along each side of the neck, merging within the skull to form the single, midline basilar artery. As the supplying component of the vertebrobasilar vascular system, the vertebral arteries provide supply blood to the upper spinal cord, brainstem, cerebellum, and posterior part of brain. The vertebral arteries usually arise from the posterosuperior aspect of the central subclavian arteries on each side of the body, then enter deep to the transverse process at the level of the 6th cervical vertebrae (C6), or occasionally (in 7.5% of cases) at the level of C7. They then proceed superiorly, in the transverse foramen of each cervical vertebra. Once they have passed through the transverse foramen of C1 (also known as the atlas), the vertebral arteries travel across the posterior arch of C1 and through the suboccipital triangle before entering the foramen magnum. Nunziante Ippolito, a Neapolitan physician, identified the "angle of Nunziante Ippolito" to find the vertebral artery, between the anterior scalene muscle and the longus colli muscle. The second (foraminal) part runs upward through the transverse foramina of the C6 to C2 vertebrae, and is surrounded by branches from the inferior cervical sympathetic ganglion and by a plexus of veins which unite to form the vertebral vein at the lower part of the neck. It is situated in front of the trunks of the cervical nerves, and pursues an almost vertical course as far as the transverse process of the axis. The third (extradural or atlantic) part issues from the C2 foramen transversarium on the medial side of the Rectus capitis lateralis. It is further subdivided into the vertical part V3v passing vertically upwards, crossing the C2 root and entering the foramen transversarium of C1, and the horizontal part V3h, curving medially and posteriorly behind the superior articular process of the atlas, the anterior ramus of the first cervical nerve being on its medial side; it then lies in the groove on the upper surface of the posterior arch of the atlas, and enters the vertebral canal by passing beneath the posterior atlantoöccipital membrane. This part of the artery is covered by the Semispinalis capitis and is contained in the suboccipital triangle—a triangular space bounded by the Rectus capitis posterior major, the Obliquus superior, and the Obliquus inferior. The first cervical or suboccipital nerve lies between the artery and the posterior arch of the atlas. The fourth (intradural or intracranial) part pierces the dura mater and inclines medialward to the front of the medulla oblongata; it is placed between the hypoglossal nerve and the anterior root of the first cervical nerve and beneath the first digitation of the ligamentum denticulatum. At the lower border of the pons it unites with the vessel of the opposite side to form the basilar artery. 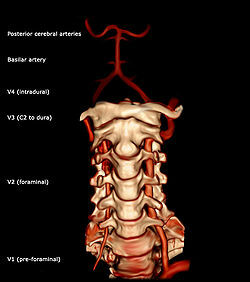 There is commonly variations in the course and size of the vertebral arteries. For example, differences in size between left and right vertebral arteries may range from a slight asymmetry to marked hypoplasia of one side, with studies estimating a prevalence of unilateral vertebral artery hypoplasia between 2% to 25%. In 3-15% of the population, a bony bridge called the arcuate foramen covers the groove for the vertebral artery on vertebra C1. ^ a b c d Standing S, Borely NR, Collins P, Crossman AR, Gatzoulis MA, Healy GC, et al. (2008). Gray's Anatomy: The Anatomical Basis of Clinical Practice (40th ed.). London: Churchill Livingstone. ISBN 978-0-8089-2371-8. ^ Yuan SM (February 2016). "Aberrant Origin of Vertebral Artery and its Clinical Implications". Brazilian Journal of Cardiovascular Surgery. 31 (1): 52–9. doi:10.5935/1678-9741.20150071. PMC 5062690. PMID 27074275. ^ Park JH, Kim JM, Roh JK (September 2007). "Hypoplastic vertebral artery: frequency and associations with ischaemic stroke territory". Journal of Neurology, Neurosurgery, and Psychiatry. 78 (9): 954–8. doi:10.1136/jnnp.2006.105767. PMC 2117863. PMID 17098838. Diagram of the arterial circulation at the base of the brain. Relationship of the vertebral artery to the suboccipital muscles. Wikimedia Commons has media related to Vertebral artery.